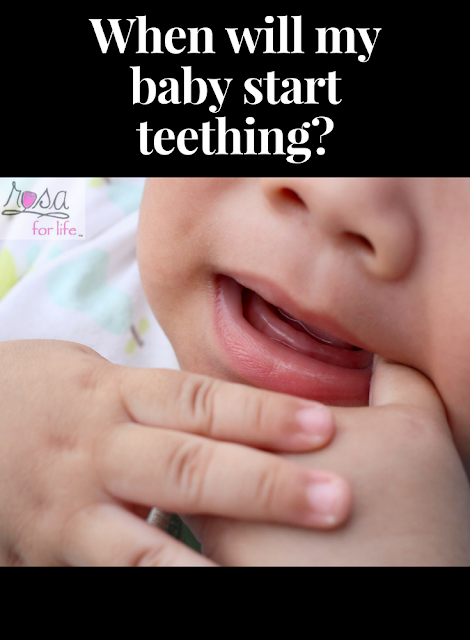 When to Expect Teething to Begin. "Most babies' teeth begin to erupt between the ages of 4 to 6 months, though for some it may be earlier or later," Dr. Josen says. And no matter what Grandma says, when your child's first tooth pops in, it has nothing to do with smarts. https://www.mamanatural.com/7-signs-your-baby-is-teething/ Most children have all of their primary teeth by age three. The process of getting these teeth can be effortless or excruciating depending on your baby. Even with minor cases, most babies show some teething symptoms. The tricky thing about teething is that symptoms can start 2 to 3 months before a tooth surfaces!